Everyone knows it’s important to get recommendations on LinkedIn, but it’s also just as important to give recommendations to other people. Think about it. You want to brand yourself as a leader and executive. Leaders and executives don’t just get recommendations, they give them! Most people only provide recommendations when asked. Instead, give recommendations out of the goodness of your heart. Make it a part of your professional life. Once a month, look back and determine who did good by you. Who inspired and impressed you? Without anyone asking, send a glowing recommendation. You might be surprised by the good things that happen when all that karma comes back to you. In addition to good karma, writing recommendations for others is a great way to promote yourself. Within the recommendation, introduce yourself and explain what you do. Not only does this give the recommendation context and credibility, but also it serves to get the word out about you. As a Financial Advisor, I work with many small business owners, helping them reach their financial planning goals. I frequently refer Jill Schwettie to my clients that need a small business advisor. The feedback my clients provide me regarding Jill is always very positive. Jill’s marketing advice has been instrumental in helping me expand my business. When you are ready to take your business to the next level, reach out to Jill. People who read this recommendation may find themselves not only impressed with the person recommended, but also curious about the person providing the recommendation. 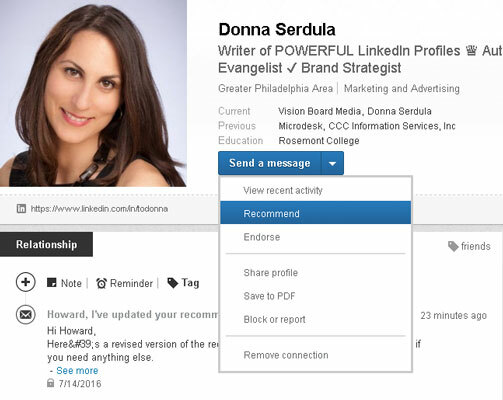 Remember, the power of LinkedIn recommendations is the ability to click to learn more about the person providing the recommendation, and when you provide a well-written recommendation, a person may click on your profile to learn more about you, the recommender. In the LinkedIn search bar, type the name of the person you want to recommend and click the search button. A list of profiles matching the name appears. Open the profile of the person you want to recommend by clicking the search result. Hover your mouse pointer over the down arrow next to the Send a Message button and select Recommend. The Recommendation Management page opens, as shown. The first text area is where you write your recommendation. If the person provided the recommendation for you, this is where you copy it and make any tweaks. Filling out the recommendation form. Edit the prepopulated text in the message section of the form if you’d like. This message alerts the person for whom you wrote a recommendation. In the What’s Your Relationship field, choose your relationship to the person. You have numerous options. Read through the list carefully and choose the relationship that most closely echoes yours. In the What Were Your Positions at the Time field, click the drop-down lists to choose your position and the position of the person you are recommending. 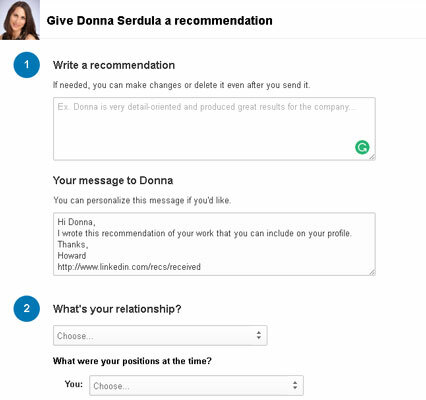 The drop-down list contains a listing of the person’s experiences as listed on his or her LinkedIn profile. Click the Send button when you are ready to send your recommendation. LinkedIn displays a banner on top of the page that lets you know the recommendation was sent successfully. Some experts out there may tell you that you can have too many recommendations on your LinkedIn profile. As long as the recommendations are genuine, authentic, come from people within your network, and align you with your career future, you truly can’t have too many. Accept and show genuine recommendations from good people and never be afraid to remove a recommendation.